Rebuplika ng TM offer new portable pocket Wifi Hotspot and they call it EasyMyFi. EasyMyFi is a mobile pocket WiFi with TM LTE SIM inside. When you register with any EasySURF Promo Data using TM EasyMyFi SIM, you can share your EasySURF mobile data with up to 16 devices simultaneously . 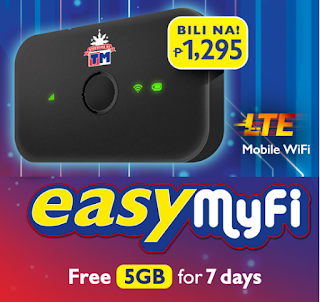 TM EasyMyFi uses LTE connection.You can enjoy streaming , playing games and surf anywhere even if there is no WiFi public hotspot.You can also receive messages on this device and to access it open your browser and type 192.168.8.1. To access another setting you need to login. The default username and password will appear behind your pocket wifi. How much is TM EasyMyFi? 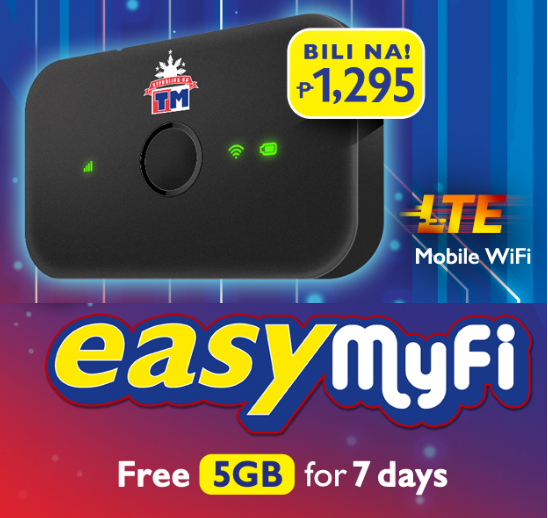 TM EasyMyFi device is only PHP 1,295, It's worth it since you only need to pay the device one time payment only and it can take up to 16 devices. Place TM EasyMyFi SIM inside the cellphone. Wait for the confirmation message before removing the SIM. After receiving confirmation message, transfer TM EasyMyFi SIM to EasyMyFi device and you can use and share your LTE WiFi connection. Best for me if your Pocket WiFi is outdated you need to change it to LTE device for better speed and performance.This device is commonly use for those user who use multiple devices and if you are foreigner here in Philippines this device is useful for you, just for example if you use google maps or any navigation application you need stable internet. Rebuplika ng TM offer new portable pocket Wifi Hotspot and they call it EasyMyFi. EasyMyFi is a mobile pocket WiFi with TM LTE SIM inside. When you register with any EasySURF Promo Data using TM EasyMyFi SIM, you can share your EasySURF mobile data with up to 16 devices simultaneously . TM EasyMyFi uses LTE connection.You can enjoy streaming , playing games and surf anywhere even if there is no WiFi public hotspot.